In this edited volume, the real dialogue begins. Therapists speak openly and honestly about their self-disclosure practices, decisions and clinical dilemmas. Bloomgarden and Mennuti bring together research, training and tales from their clinical experience to illuminate lessons derived from their own journeys toward judicious, balanced self-disclosure practices. In a readable fashion, the stories highlight a variety of self-disclosure and boundary issues that occur in the course of psychotherapy. Numerous treatment modalities and clinical orientations are represented. The collective wisdom offered through these stories, which includes suggested guidelines and a standard of care for good practice, will assist the reader in developing a better understanding of what it means to self-disclose appropriately, recognizing a flexible middle ground between "too much" and "too little" along with responsiveness to client need. The Freudian based taboo that rigidly warns against all self-disclosure is antiquated, and a more reasonable, balanced perspective is under way. 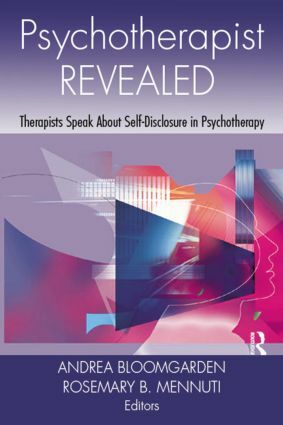 As a psychotherapeutic community, including psychologists, social workers, art therapists, counselors, dance/movement therapists who are all represented in this book, it is time to talk openly about a balanced, judicious, and therapeutically appropriate approach to self-disclosure and boundaries. Bravely, that is exactly what the authors in this book have done.